Reference number for this case: Oct-54-Metz. Thank you for including this reference number in any correspondence with me regarding this case. Must we believe in the flying saucers? - It is to answer the general emotion, and at the same time at the request of the scientific Research, that I write these documentary lines. The stellar, atmospheric and even telluric phenomena are so numerous and sometimes frequent [sic!] under the cap of the skies, that one should not imagine that the flying saucers and flying pots are an exclusive invention of our atomic century. There was, at all the times - whatever names they are called - celestial fires, more or less developed, sparkling and sometimes terrifying, which, going down in vertical or oblique trajectories [redundancy] attracted the amazed glances of men, by taking in their fall on the terrestrial globe the most sensational and most fantastic forms, very able to disturb the public opinion. The Celtic Library of Paris made us known recently in a most documented book, what were in Brittany, in the Middle Age, the appearances of flying pans. They were celestial phenomena that multiplied as much inside the imagination of the men as in the reality, and to which popular fright attached predictions of death and of catastrophes [meteors and comets]. These luminous phenomena burst especially in the very dark nights, taking the shape of blazing church candles [the author is a clergyman] which ignited, died out, flew away and disappeared mysteriously. Sometimes they took the shape of brilliant candles which were planted and floated on a pond [will-o'-the-wisps]; sometimes they resembled wavering candles which burned their top upside down. But these candles were only small gleams compared to "étavas" of enormous torches, shining like stars, and which had the shape spherical of large frying pans [meteors]. Their light was of a greenish blue or a saffron yellow, or of a purplished red, uniting with the obscured [?] colors of the rainbow. Their form was often confused with that of the disc of a pan provided with a tail and this tail [the trail of the meteors] itself seemed to shine of stellar sparks, like the tail of a comet. From appearance of the luminous discs to planetary phenomena, there was only only one step, easy to cross. Therefore the public opinion saw in this very quickly warnings of the heavens and sign of misfortune. It will be enough for me to have evoked these visions of the past to render comprehensible that there were from immemorial time luminous celestial phenomena, of an often disconcerting shape, which defrayed the conversations and frightened the credulous minds. One can add that it formed, at these times, true epidemics of fortune-tellers that, in their disorder rather than in the possessions of themselves, are drawn at changing the luminous discs that they can see into stoves, candles, torches, cigars, pots and even flying carriages. From the carriage one passes easily to the notion of a driver, even accompanied by comrades, as in the flying saucer, necessarily less bulky [! ], where one claims to have seen some small dwarf of another world. Thus thousand years ago and more, luminous pans were directed occasionally by hairy Pygmies, with the alarming eyes of shining light. So, there are few changes among the fortune-tellers of today, of which some are bragging about having seen Martians, dressed of tin or of aluminium, who speak Russian, Esperanto or Congolan. It thus does really seem that our century nevertheless wins over the previous times by the aforesaid appearances, or rather by the imaginary designs by facetious witnesses. It is so true that man, in spite of himself, obstinately turns to the supernatural [the concept of Martians visitors does not belong to the supernatural] because of this word of Alfred de Musset: "the infinite one torments us!" It is time to see what truth or forgery is concealed in all the accounts of flying saucers of 20th century [ufology]. I extract from the bunch the most silly stories that were brought back to us by the gazettes, some examples which will be enough [error] to enable us to analyze as deep as we whish the intrinsic value or extrinsic value of the luminous machines which are presented to us. First case. -- Three farm labourers saw, in the sky of Allier, an enormous flying cigar which after various rising and downward evolutions, fell down like an arrow on the ground to burst, in the manner of a bombshell, in a cloud of dust. Traditional vision [not]. Second case. -- Two motorists saw very close to Orleans at midnight, a luminous disc which first of all seemed to swing through the clouds, appearing and disappearing, to take suddenly the vertical and to come to burst on the ground in a marvellous fireworks. Another traditional [not], very probable example. Third case. -- A cyclist returning at his place at two o'clock in the morning, the other Sunday, met with a Martian who froze him on the spot, while jumping at him to the neck and giving him the accodance of his aluminium lips, to flee in a blow of wind on the very bicycle of our stunned man. -- Burlesque and ridiculous, if not certainly absurd [the author made this up entirely, putting together the Mazaud case and other cases!]. span class="highlight"Fourth case. -- This example is the humorous bouquet [selected precisely for that], which overrides all imaginations! The small moony disappeared, and the native of the Moselle region faints with stupor! Conclusion. -- There are certainly occasional observers who look at, admire, and see things approaching possible luminous realities. But there are other who certainly see with closed eyes, in order to better utter all the conceptions of their imagination and their tartarinesques jokes. Here is the summary of all [not] stories of flying saucers, the ones probable [certainly], other completion imaginary [certainly]. What is it then? [discussion coming after the conclusion.] What can be the base of the true luminous discs - whether they bear a name or another - which seem to appear during the night [not] at various times? Read well. There is above our heads an immense vault [not] called the heavens. This firmament is strewn with stars, planets and stars ['astres' and 'étoiles', he wrote. Of course astres is just a synonyme of étoiles, hence "stars and stars"]. Which weak rays guide us in the shade." the shining star of the day does not paint its image." The planets are celestial bodies which do not have their own light, receiving it from the sun around of which they revolve [Certainly]. The eight large planets visible with the naked eye are, starting from the Sun: Mercury, Venus, Earth, Mars, Jupiter, Saturn, Uranus and Neptune [The Abbot speaks the truth.] There is a also certain number of secondary planets. The stars, contrary to the planets, are fixed stars, which shine of their own light: Sirius is one of most brilliant among the stars which can, in their turn, like the sun, be the center of other planetary systems. Their number is indefinite [Indeed; there is more than 100 000 000 000 stars in our galaxy]. Pierre Bardou, factory worker, opens his door towards 5 o'clock to return to his work, when he sees in front of him a pretty junior clerk in a cassock (?) who sings to him in a crystalline voice a poem with absurd verses, then disappears. 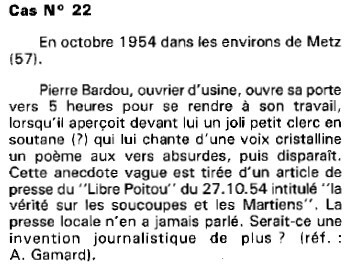 This vague anecdote comes from a Press article in the "Libre Poitou" for 10/27/.54 headlined "the truth on the saucers and the Martians". The local press never spoke about it. Could this be one more journalistic invention? (ref. : A. Gamard). Factory worker Pierre Bardou was walking on his way to work when he saw in front of him a small monk-like figure wearing a dark smock that chanted in a bizarre "crystalline" voice, absurd verses and poems. The figure suddenly disappeared. Factory worker Pierre Bardou was walking on his way to work when he saw in front of him a small monk-like figure wearing a dark smock that chanted in a bizarre “crystalline” voice, absurd verses and poems. The figure suddenly disappeared. Not looked for yet. Obvious invention by abbot Largeac. [ll1] Article in the regional newspaper Le Libre Poitou, France, October 27, 1954. [rr1] "Catalogue Régional des Observations d'Humanoïdes du Nord-Est de la France et du Luxembourg (1)", compiled by Raoul Robé, Alain Gamard, M.L. Blaise, M.D. Bleux, in the ufology magazine Lumières Dans la Nuit (LDLN), France, page 41, September - October 1986. 0.1 Patrick Gross February 10, 2005 First published. 1.0 Patrick Gross March 1, 2010 Conversion from HTML to XHTML Strict. First formal version. Addition [ll1]. 1.1 Patrick Gross August 19, 2010 Addition [rr1]. 1.2 Patrick Gross October 7, 2014 Addition [ta1]. This page was last updated on October 7, 2014.